I'm going to be blunt - people can be incredibly dim about cleansing their skin. I've lost count of the times I've spotted a cheap, harsh, foaming bottle from the drugstore on the same counter as a $100 face cream and designer makeup, and it flies in the face of logic - stripping skin before slapping on expensive treatments to counteract all that damage. Madness! Oil is what breaks down oil, deep cleaning into pores without breaking the fragile lipid barrier - so stop using detergents on your face. Please. So, as you might imagine, a good, creamy cleanser is always the first item I recommend to people looking to revamp their routine or improve problem compexions. I feel very strongly about it. I'm even forced into using exclamation marks. When skin is primed properly, and gently, you can toss expensive treatments, use less moisturizer and keep skin so much happier and healthier. And the act of cleasing itself - massaging a creamy dollop into your tired, dirty visage, then gently wiping off with a steamy hot cloth - really is sublimely therapeutic, to skin and senses. Basically, once you go hot cloth cleansing, you don't go back. 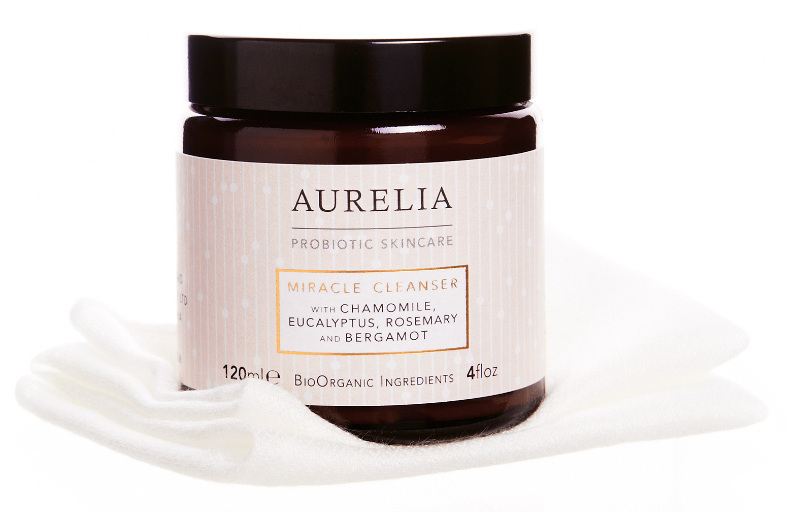 The newest, brightest star on the creamy cleanser front, one that had me hooked at first use, is the aptly named Miracle Cleanser from Aurelia Probiotic Skincare, a small UK-based brand with the purest of ingredients and ethics. The cool, creamy concoction breaks down makeup and oils expertly with coconut derived cleansing agents, fatty acids, cocoa and shea butters, while soothing and nourishing the skin with botanical extracts like kigelia and baobab and their flagship probiotic proteins. But it's the blend of eucalyptus, rosemary and chamomile essential oils that's elevated this into cult classic status in the beauty world already. The gorgeous, invigorating scent is like a creamy, couture Noxzema - waking up senses in the morning and wiping away the stress of the day at night. Fair warning - it's additive. Since adding this to my routine, I find I'm looking for any excuse to wash my face. I've started humming chipper tunes in the bathroom while I cleanse. Yesterday I woke up at an ungodly early hour and went jogging. I'd be horrified if my skin didn't look so gorgeous. And it really is gorgeous. Obviously I take care of it, and it's ever really that bad to begin with, but there's a more even-toned glow, a clean, soft, smooth feel that the Miracle Cleanser has most definitely imparted. I've stopped using any serums, treatments, exfoliants - just this and my usual moisturizer, and the results are, well, miraculous. Unfortunately I've used my jar up much too quickly - it's easy to ration, but I like to slather on several finger-fulls and really go to town with the whole facial massage routine, meaning that stores are getting ominously low. Will I'll return to my sloveny, lazy self without my Miracle Cleanser fix? I don't intend to find out, as I'll be re-ordering. Ad infinitum. The Miracle Cleanser is $53 for a 4 oz jar, not at all pricey for a luxury cream or balm cleanser, as it lasts for ages, but an investment for those of you used to skimping on cleansers (fools). Aurelia is one of those brands I'm so happy to see do well, and that I can stomach paying a solid price for. They're passionate, as they well should be, about products they've formulated with incredible detail, love and care. I love the little touches you get with a small, beautifully-run line like this - the gorgeous, hand-wrapped packages, the luxurious, heavy glass jars and bottles, ingredients of a quality that organic doesn't begin to cover. So go and buy this immediately - it gets The Blossom Shed seal of approval and then some. Now I'm off to wash my face. Again. *This product was a PR sample from the generous people at Aurelia Skincare. This in no way effects my opinions - if I don't like a product, I don't feature it! 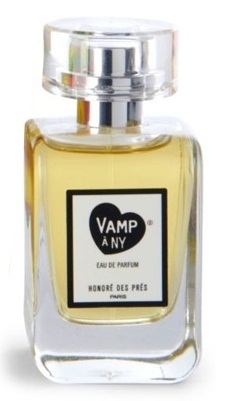 Vamp à NY starts out with a creamy, crass hit of tuberose – it carries all the wallop of the sultry white flower without that sharp, sometimes acrid note that makes me tend to dislike white florals. This is an altogether rounder, juicier take on the bloom, more like the flower in its natural tropical state. There's an almost palpable texture to the flower, a distinctive rubbery waxiness. If you know and love tuberose you'll know exactly what I mean. If not, well, this is only going to get weirder from here on out. After the first hit of tuberose, I smell a lot of ylang ylang creeping in, fleshing out the floral into something even headier and bolder - then a sweet, sticky rum note, a hint of pulpy fruit (banana skin? coconut flesh?) and an aromatic swirl of real, sharp, bourbon vanilla. There's hints of exotic resins and balms deep down in the vanilla, but to my nose they're faint and fleeting. Overall, I get the impression of bubblegum and hot pink sunsets and muggy, sultry evenings full of flowers. Once dried down on skin, the fragrance doesn't change or evolve much – it sticks around as a deep, sweet, sticky flavor – like candied tropical blooms, preserved in rum syrup. It teeters on the edge of feeling overpowering but settles quickly into something very wearable, with a definite modern uniqueness that suits the perfume landscape right now . I was expecting something much more demure, and I have to say, for a naturally sourced scent, Vamp à NY is a bit of a loudmouth. Which brings us to the name – I think it's ever so slightly misleading in English, suggesting that this is some sort of sophisticated screen siren's fragrance. For me, this is less femme fatale and more girly girl playing dress up as a cartoon vamp - red lipstick and slinky gown, but maybe some high tops peeking out under the hem, smacking her pink bubblegum a little too loudly. It's the sort of scent that could get you in trouble, or into a whole lot of fun. It's a playful, modern and youthful take on the classic vampy white flower perfume. I'm still not much of a tuberose girl at heart, so I'm unlikely to wear this very often, but I also can't help but appreciate what an endeavor it was to make a perfume with this much character and wit and panache, from ingredients that usually render altogether more staid affairs. It's almost wonderfully tacky, in a stylish, French sort of way – and I mean that as the greatest of compliments. You can find Vamp à NY at Beauty Habit, Spirit Beauty Lounge and Anthropologie. Are you a tuberose kind of girl? Planning to vamp it up a bit with your fragrance this summer? Let's chat below! *This product was a PR sample from the generous people at Honore des Pres. This in no way effects my opinions - if I don't like a product, I don't feature it! 1) Pink cocktails and Clarins Clementine lipstick . 2) A sinfully delicious dinner at The Smith. 3) The Killers at Madison Square Garden - perfection, as always. 4) The Guerlain counter at Bergdorf's - basically, heaven. 5) Mismatched china and shabby chintz at my beloved Tea and Sympathy. 6) A leisurely wander 'round the Met - inc. the stunning Civil War Photography exhibit. Despite some minor disappointments - it wasn't opera season, the weather was a bit too chilly, Chuck Bass wasn't waiting for me at Grand Central Station - it was still a delightful little getaway. Have you ever been to New York? Have a favorite spot you always visit? Tell me about it below! 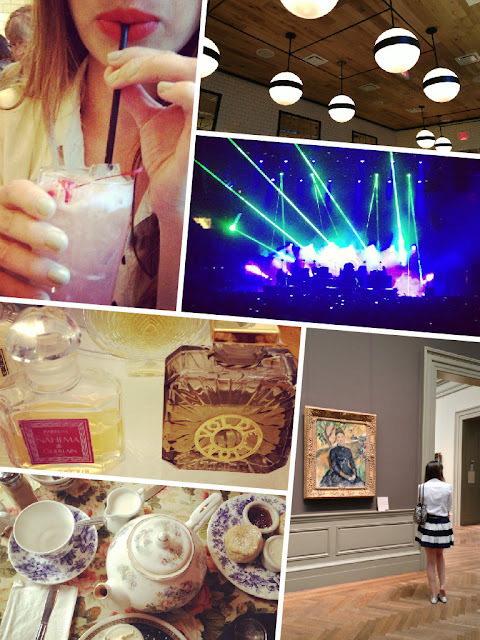 Labels: Gorgeous Getaways, Guerlain, New York, Style. Mother's Day is approaching, so let's just say it like it is - we'd be nothing without our moms. Besides the whole giving life, raising us, unconditional love part, there's those subtle little things they've given us that make us who we are. I think of my love of animals as something that defines me, but guess what? It comes from my mom. Ditto a penchant for English murder mysteries and pretty clothes, and one hell of a sweet tooth. Whenever we act kind, or silly, or hardworking or brave, it's because someone taught us well, and that someone is usually a mom. So in celebration of all of mothers and mother figures, I'm thrilled to be able to team up with the fabulous New London Pharmacy to offer one lucky winner a ridiculously lovely beauty bundle, valued at over $400, and full of pampering goodies for the perfect girl's night in. Think a mom you know deserves a treat? Here's your chance to win a luxurious collection of pretty products just for her (of if you're a mom yourself, just for you!). Apple & Bee Train Case, Kevyn Aucoin Making Faces Collection Volume I Kit, Rahua Shampoo and Conditioner, The "Wet" Brush, Molton Brown Blissful Templetree Bath & Shower Gel, Forever Natural Bamboo & Jute Back Strap,The Thymes Lotus Santal Body Lotion, Supersmile Whitening Toothpaste, Elgydium Whitening Toothbrush, Fa Pink Passion Deo Roll-on, Jane Iredale Cherish Lip Fixation, Tweezerman Mani Brow Rescue Kit, Basicare Manicure Tool Kit, Gehwol Footcream, Butter London Primrose Hill Picnic Nail Color, and V Beaute' Lip Spread Anti-Age Tinting Lip Gloss. Follow The Blossom Shed on Bloglovin, Facebook or Twitter (or all three!). Sign up for New London Pharmacy's Newsletter on their website. Leave a comment below telling us what makes your mom (or a mom you know, or being a mom yourself) so special! Open to US adresses only, and hurry, giveway closes at midnight, Saturday May 11th. Good luck! What catches your eye in this garden of gorgeousness? 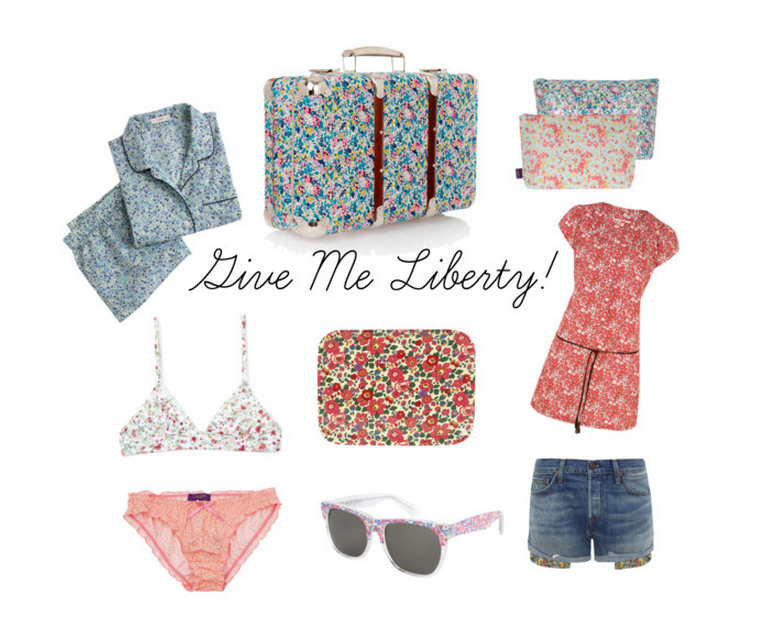 Have a particularly favorite Liberty print? Tell me about it below! J. Crew Short Pajamas / Liberty Suitcase / Liberty Washbags / Sessun Dress / Levi's x Liberty Shorts / Liberty Wooden Tray / Retrosuperfuture Sunglasses / Liberty Frill Knickers / Karla Spetic Triangle Bra. Labels: Fashion, Karla Spetic, Levi's, Liberty, Sessun, Style.